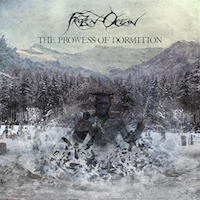 Black metal and electronic music – it sounds like a strange combination at first, but it works on “The Prowess of Dormition”, one of two 2016 releases by the prolific one-man operation that is Frozen Ocean. Opener “No Blizzard” starts with a slow tempo and acoustic guitars. The synths in the background add to the atmospheric part of FROZEN OCEAN’s black metal sound. Tremolo picking brings in the heavier part of the song. The vocals are evocative of the cold climate of Vaarwel’s Moscow, Russia home. In contrast to these heavier parts is the soft, twinkling synths near the end. This part doesn’t seem out of place given the earlier synth parts. The beginning of “Once Aglow” picks up the pace somewhat. This track has a powerful main riff, with lower-tuned countermelodies giving it solid support. The bass is nicely audible here, and has rich tones. The track later enters into an interesting contrast in the form of a piano part which echoes the main riff from earlier in the track. This is a nice touch which aids in maintaining the song’s coherence. Ticking cymbals then bring the song back to the heavy side, with an alternate-picking guitar riff creating a countermelody to the rhythm part. The synths work well here too; they add interest while not appearing gimmicky. “Det Siste Snøfallet” has a classic second-wave, mid-tempo black metal sound. A brief bass riff brings in a tempo change, and with it comes a powerful clean riff. Mournful countermelodies pepper the track. As on the rest of the EP, the drumming sounds more or less natural despite being programmed. Vaarwel manages to get that organic feel typical of most black metal, as far as my ears could tell. The title track makes for a powerful closer. Sad, echoing riffs play out over a countermelody. The motif of the intro riff is carried over when the full band comes in, thus keeping things coherent without resorting to the boring choice of repeating the same riff over and over (some riffs work in repetition – see some doom metal bands – but some riffs don’t necessarily stand up over longer periods). The clean riffs add interest throughout the track. A quiet interlude echoes the main riff, which prevents it from seeming abrupt. Near the end, there are vocal countermelodies, which add texture to the vocal performance. Vaarwel has done a mostly good job on this album, and has blended black metal and electronica in such a way that the combination doesn’t feel jarring. In my humble opinion, this is one of the better one-man black metal releases.